Bat's echolocation, their "superpower", is now being harnessed by researchers to enhance the current navigation system and autonomy of drones. Researchers are now taking advantage of bat biomimicry to improve today’s drone technology. Engineers from the University of Cincinnati‘s College of Engineering and Applied Sciences used bat biomimicry to fly drones around obstacles in the dark. Bats, of course, are nocturnal. Thus, they depend on sound and echolocation to operate in the dark to search for food. It is said that the sonar used by bats is highly sensitive that it allows nectar-loving bats to find their favorite flowers just by relying on sound. This alleged “superpower” is now being harnessed by researchers to enhance the current navigation system and autonomy of drones. To date, drones are being controlled by human pilots who use their eye sights, as well as, video cameras, global positioning satellites, and laser-based radar or LIDAR to fly them. For years, UC researchers have been working on creating autonomous drones that only depend on logic and artificial intelligence to operate. However, for their latest drone project, the UC researchers added a new layer of navigation: sound. UC researcher and bat expert Dieter Vanderels wanted to equip all drones with echolocation to help them avoid obstacles while flying autonomously. The researchers believe that bat mimicry could have useful benefits when LIDAR and satellite systems fail to work correctly in certain situations or locations. The sensor system developed by Vanderelst was designed with inspiration from nature. He 3D-printed the heads of tiny leaf-nosed bats and used them as his reference. Then, he made robot microphones that mimic the shape and contour of bat ears. He then placed them slightly offset on the robot frame in a similar way an owl’s ears are asymmetrical on its skull. 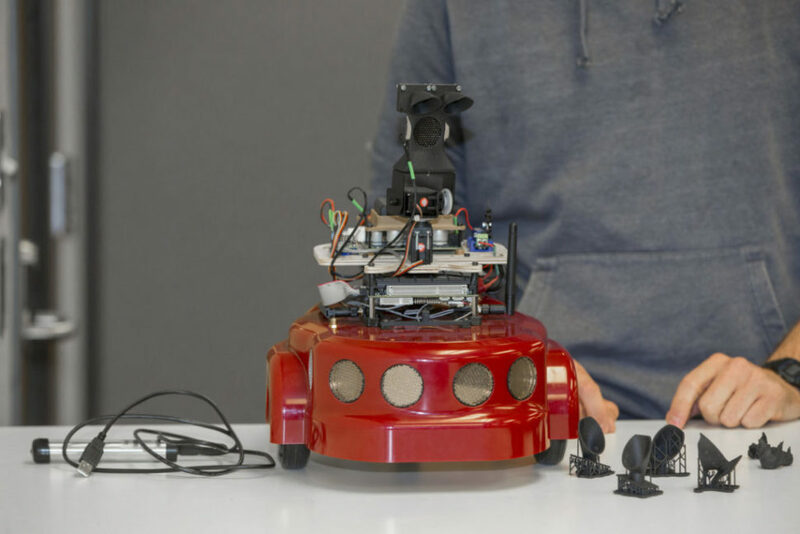 The robot has three wheels, an array of ultrasonic speakers, and microphones that produce tones or pulses of sound and sensors to detect the echo reflections. The robot’s bat-like chirps range from 25 to 75 kilohertz. However, Vanderelst said 50 is the sweet spot, so the drone should be as acrobatic as bats to capture their echolocation ability. Where else do you think bat biomimicry could find useful applications?